The San Pedro Volcano with the La Poruna Cone and lava flow in the foreground. Dark material in the closer foreground is from a debris avalance caused when the older edifice collapsed leaving the horseshoe shaped crater we see today. The San Pedro Volcano at Sunset, taken from our camp in the La Poruna lava 's (seen in the foreground). Click the image for Hi-Rez. The lava flows at San Pedro are significantly larger than the flows across the street at La Poruna. Smithsonian Institute / USGS Global Volcanism Program. San Pedro Volcano Description. Francis, P.W. et al. 1974. 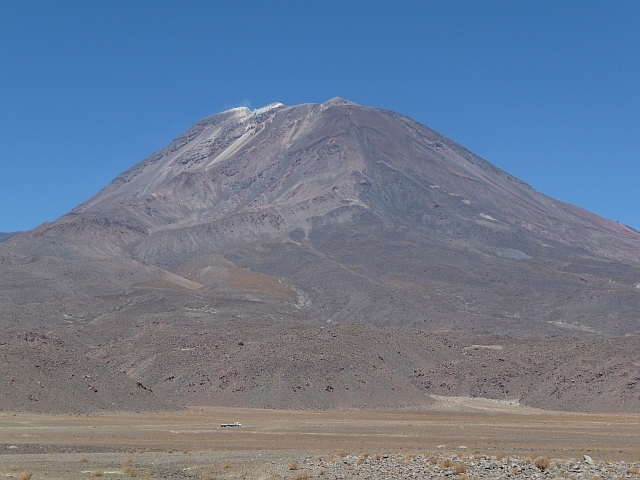 The San Pedro and San Pablo volcanoes of northern Chile and their hot avalanche deposits. Geologische Rundschau 63, 357-388. Peckyno, R, S de Silva. R M Lopes. D Pieri. "LAMDA - The Lava Morphology Database: First Results and Interpretations" (POSTER) AGU Annual Meeting. December 2009, San Francisco, CA. Peckyno, R. Lava Lobation and Margin Analysis. 2010, Oregon State University Masters Thesis.